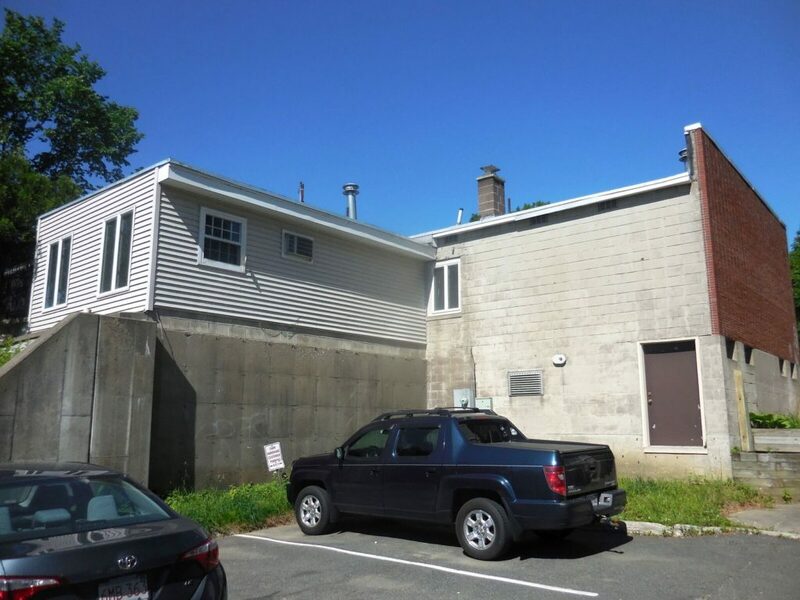 The former commercial kitchen of the Daily Bread bakery at 82 Railroad St., a nondescript windowless building, where Andy Vincent and Brian Vincent are planning to open Commonwealth Cultivation, the third retail marijuana outlet in Great Barrington, Mass. The rear of the building faces the Taconic Parking lot and Carr Hardware. Great Barrington — The retail cannabis market in South County is about to get a little more crowded — and potentially more lucrative for Great Barrington. The town is now confronted with its third application for a retail recreational marijuana store. 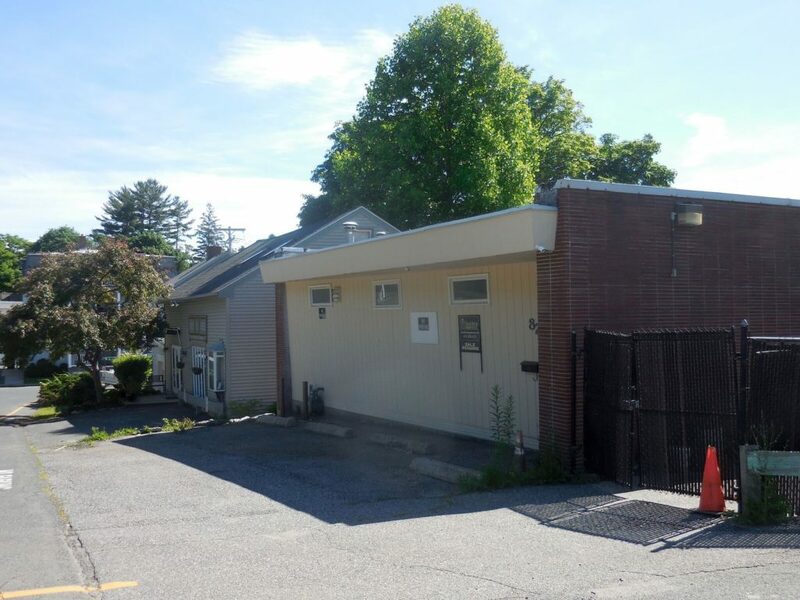 That latest application, from two brothers from Connecticut, has served to highlight the fact that the process for obtaining the necessary approvals isn’t terribly clear on the town level. 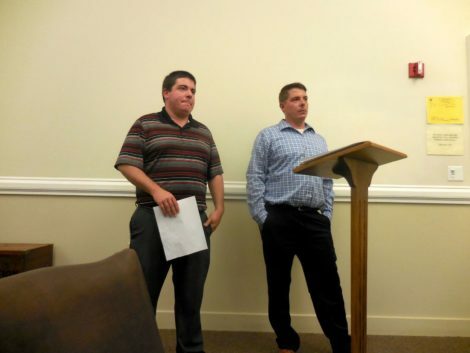 Brian Vincent and Andy Vincent are looking to establish a retail outlet at 82 Railroad St. The building is not actually located on what most people consider to be Railroad Street. It’s a fairly nondescript structure on the upper part of Railroad Street beyond the back entrance to the Triplex Cinema, near where it intersects with Elm Street. The front entrance of the brick-and-cinderblock building faces Railroad Street, while the rear of the building and a loading dock-style door face the parking lot of Carr Hardware. The Vincents have dubbed their new company Commonwealth Cultivation. Click here to read their filing with the secretary of state’s office. They appeared at last Thursday’s planning board meeting to discuss a site plan review but did not really have all the necessary documents. That could be because the town does not have a clear procedure and timeline for processing applicants for marijuana shops. “This is like the wild west,” said Selectman Ed Abrahams, who has taken the lead in streamlining the process, which was prompted when the cultivation, sale and use of recreational cannabis-related products was legalized in Massachusetts through a 2016 ballot initiative. Sales could begin as early as next month. Applicants cannot sell any marijuana products without a licence from the state and the Vincent brothers have an application pending before the Cannabis Control Commission. On the town level, before a state license can be granted, retail applicants need a negotiated host agreement and they must hold a so-called community outreach meeting to field questions from the public. Click here to view such a meeting earlier this year for a retail and cultivation facility planned in Sheffield. The Vincents explained what their operations would look like but did not have professionally prepared documents that addressed concerns normally associated with site plan review such as lighting, parking, security, access and pedestrian safety. Planning board Chair Brandee Nelson asked the Vincents for a floor plan. Brian Vincent explained that they planned to produce a floor plan of the project after it was approved. “You’re in a bit of a chicken-and-egg here,” Nelson replied. She asked the Vincents to return to the board’s Thursday, June 28, meeting with the required documents. The men explained the project anyway. They are renting the building from Highland Capital Realty, which has signed a deal to purchase the property, which formerly housed the commercial kitchen of the Daily Bread Bakery, through Stone House Properties. The property is listed for sale for $505,000. The cannabis “products inside will be secured in, like, pretty much a bank vault,” Brian Vincent said. Only interior renovations are planned. There are five parking spaces in front of the building and there is additional parking across the street in a municipal lot, though the number of spots there has been greatly reduced by the new 47 Railroad Street development. There will also be a state-of-the-art security system. Andrew Vincent, Commonwealth’s vice president and treasurer, projected annual sales of $5 million per year. State law allows municipalities to add 3 percentage points to the existing state sales tax of 6.25 percent. That would result in $150,000 per year in tax revenues to the town. As per the town’s standard host agreement, Commonwealth Cultivation will make a annual $10,000 donation to a nonprofit of its choice in Great Barrington. The project will create 18 new jobs. The shop will be open from 10 a.m. to 8 p.m. seven days a week. As per state law, no one under 21 will be allowed inside the facility. Brian Vincent told Nelson his company has no plans “at this time” for another outlet in the state. However, the company also has an application pending for a cultivation facility in Pittsfield, where the Vincents plan to lease part of the former Cintas building off the Downing Industrial Parkway. They plan to spend about $200,000 renovating that space. Meanwhile, another fledgling company, Calyx Berkshire Dispensary, is looking to open its first recreational store in downtown Great Barrington in the former Joe Dagget storefront at 307 Main St. 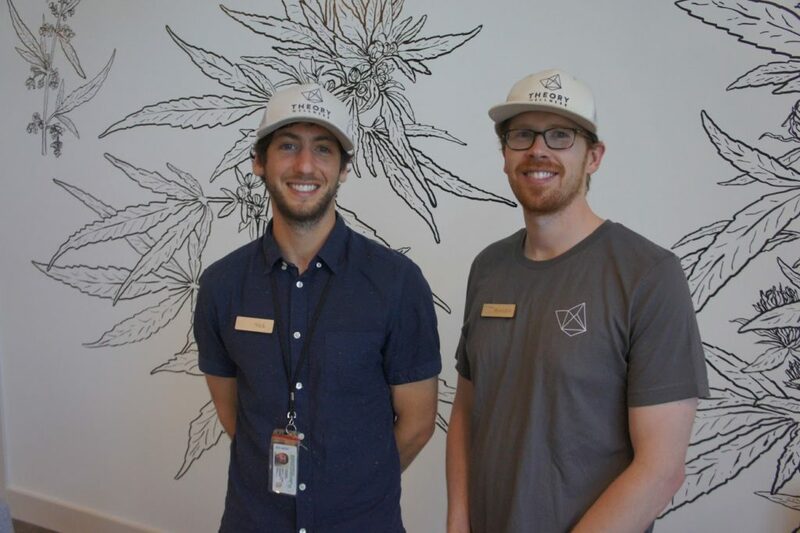 Theory Wellness on Stockbridge Road opened its doors last year as a medical marijuana dispensary, but will also offer recreational or so-called adult-use marijuana (21 and older) soon. As required by law, Theory held its community outreach forum last week at the Fairfield Inn. Theory principals Nick Friedman and Brandon Pollock answered questions from the audience and distributed a two-page FAQ sheet. Click here to read it. They plan to hire 18 to 20 additional employees. Friedman told the Edge he estimates annual adult-use revenues of between $6 million and $8 million. That would mean additional tax revenues to the town of between $180,000 and $240,000, along with the standard $10,000 donation to a nonprofit. “We briefly discussed traffic concerns and noted that we have leased additional parking spots and will be hiring more staff to increase the flow of our operations, in an effort to preemptively mitigate potential traffic impacts,” Friedman said. So if all goes well, the town could see almost $400,000 in new revenues from these two operations in a town with a nearly $27 million budget for the coming year (that total includes the town’s assessment from the Berkshire Hills Regional School District).The income total for the town does not count whatever revenues are generated from the proposed Calyx store. Earlier this year, marijuana was the cause of a battle between the Great Barrington planning and select boards over which should be the special-permit-granting authority for cultivation facilities and whether most, if not all, of the facilities should require a special permit. The selectboard won that struggle on the floor of the annual town meeting last month. Ya gotta love two brothers who come to a Planning Board meeting for a site plan review of a pot store without a site plan. I can imagine the conversation in the car beforehand…”Dude, I thought you had it!”. Lol. But seriously, this project can be a bit of a big deal and I do thank the Planning Board for asking the Vincents to return with the proper documentation next time. I have 3 questions to raise. 1. First of all, this building, though small in scale, does have a significant and less-than-attractive presence on both RR St and on the Carr lot. (The future Town Green? I’ll keep pushing this one) Is this building in a zoning district or overlay that could require exterior improvements that better relate to the up and coming appearance of the businesses around it? With projected annual sales of 5 million dollars, I don’t think financial hardship will be a restriction. 2. Saying that “there seems to be plenty of parking to us” when the conversation for years has been about the major parking struggles in this area of GB shows a lack of understanding of just where the Vincents plan to open their 5 million dollar/year in sales business. That’s nearly $15,000/day in sales, assuming they will take off at least a couple of days a year. What is the typical purchase amount per customer, how long is the typical visit and how many cars/day will this business add to an already congested area? Does the Planning Board have a long-term fix for this situation and if so, how does this proposed project fit into it? 3. And this may be a naive question, and not specific to this proposal, but are customers allowed to sample and partake of the products available in a recreationally-licensed shop? I can’t answer questions #1 or #2, but #3, the answer is no. Customers would absolutely NOT be allowed to consume cannabis products on site. The law is very clear about that. In that sense, it’s similar to a liquor store; one can purchase, but can’t consume on site. Before marijuana is sold all over Great Bartington the select board needs guidelines just as there are for liquor stores. We do not need any of these stores in the middle of our main shopping area. They should be on the edge of town with parking. Too many stores will lead to little or no profit. Let’s do our homework and not rush into this. Talk to people in Colorado as all had not gone well. Slow down selectman and planning board. Are you calling downtown Great Barrington our main shopping area? Maybe if you buy a lot of houses I guess. …The full effect of recreational marijuana sales isn’t known. Much is being made about the increased tax revenues that pot sales are expected to generate. About $400,000 is mentioned in the report but will that be enough to cover the additional cost to the town of increased services including a greater police presence that will be needed to deal with the the new breed of tokin’ tourists in town. And someone please check my math but the projected $8,000,000 in sales at $150 an ounce (an online price quote for Acapulco Gold–well above what it once cost in the ’60s) equals about 53,000 ounces. At 50 joints to the ounce (pretty fat joints–nearly cigarette size), that’s 2.67 million joints or 390 per year for each man, woman and child living in Great Barrington. One-a-Day plus. And while any new job creation is not to be scoffed at, I suspect most of the new positions in our fun town will be low-skilled, low-pay. Up next: “Up in Smoke” sequel to be filmed in good old GB…. My friend Mickey Friedman had a great idea. If it’s all about tax revenue and not about any quality of life issues, why doesn’t the Town use the old fire house and get into the business itself. This would make even more money for the town. The Town can’t do that because it sold the old fire house for a whopping $50,000. The calculations for what the increase of police and ambulance service costs to the town will be from the geniuses that shop here, toke on the street and go next door to the Childrens toy shop to purchase legos might be. A gain of 150k a year is paltry compared to what it will cost law inforcement and rehab centers. Perhaps whomever asks the townto take this on, so that they can make a fortune- will consider rebuilding the high school. That is where most of the income will come from. Why is it ok to have this shop near a toy store? How about the apathy that is created by this? Priceless – what a priveldged and consumistic way to handle our town. Think the long thoughts here friends. Not the short Instagram version.